Posted on 7 October 2016, in Autumn, Cook The Book Fridays, my paris kitchen, Summer CSA and tagged Cook The Book Fridays, my paris kitchen, winter squash. Bookmark the permalink. 13 Comments. This does look good. I love squash. Great looking squash crumble you made there! 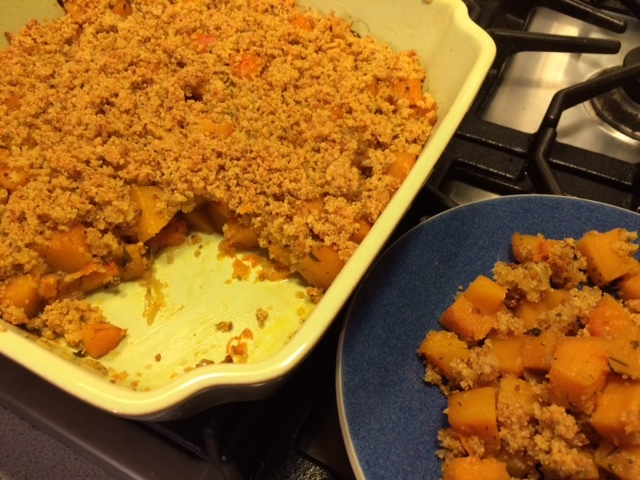 I did not pre-bake the squash mixture, one bake was enough cos I tested the squash at the pan cooking and it was done; I cannot fathom why we need to bake it so long and with the crumble topping too. We loved this! Happy Thanksgiving! 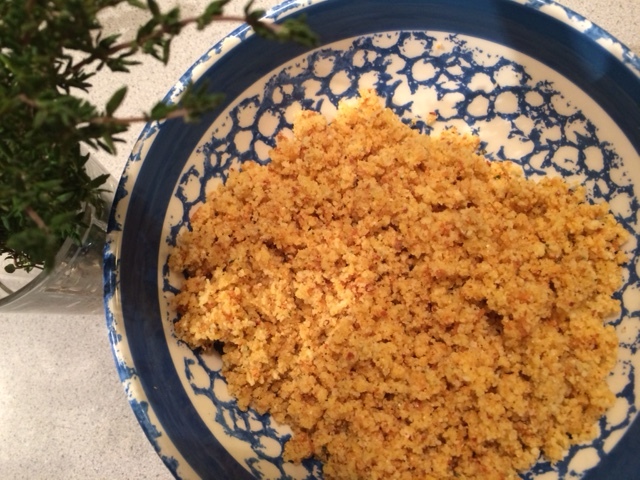 I have not tried this crumble yet but hope to this weekend! Looks divine!!! 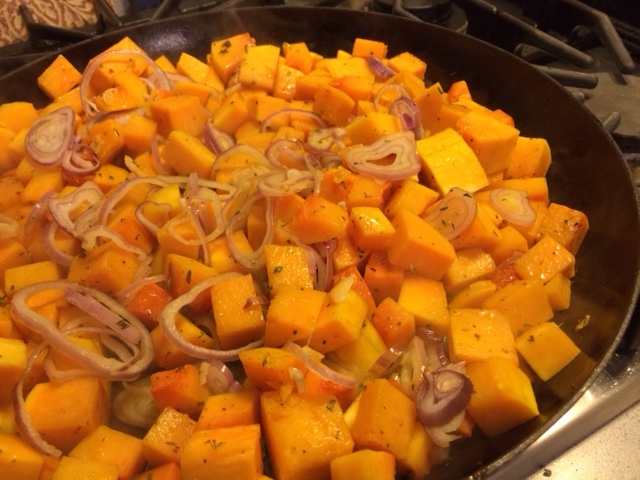 I agree with you that the two-step cooking of the butternut squash can be streamlined. I would stick with that next time I make this dish. Thanks for the very thoughtful suggestion! Yet another lovely dish from My Paris Kitchen! Sounds like a nice Thanksgiving side Betsy! This is totally a Thanksgiving side dish! I’d never thought about savoury crumbles, either, but I’m very happy to have been introduced to them. I like your thoughts for variations. There are probably as many possibilities as there are for sweet crumbles. I’ll be having this for my holiday dinner this weekend and I think I’ll be taking it to holiday tables all winter long. That step is a bit fussy, isn’t it? As I was cooking it I was thinking, “gosh there’s a lot more steps than I remember there being.” Good idea to just sauté longer so as to skip one of them. I agree about the Thanksgiving-ness of this recipe! Looks great, Betsy! I’m with you with the fussy step! I’ve used pumpkin and did not brown them, merely saute them briefly, as it is going to go into the oven for 50 minutes or so! And as far as I know, pumpkin softens very fast! overall, this is a nice side dish. Sadly, we are not going to Death Valley for Thanksgiving this year. It would have been our 10th holiday there. But, happily we will all be together in Bishop and I plan to make this recipe. Everyone will love it, I’m sure, especially my sweet 15-year-old vegetarian. I think I will skip a step, per your suggestion, and just roast the squash. Do you realize that a year ago we were in Hyde Park? Tomorrow is Eleanor Roosevelt’s 132nd Birthday. Tonight I looked at all the pictures from our trip together. What a wonderful time and memory. and I were just talking about how much fun we had there. This was a big hit for us, too!